Discover the latest fresh, exciting trends in today's Brazilian Jazz scene. 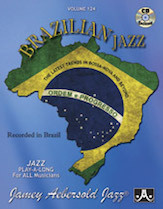 These 10 tracks, recorded in Brazil with some of its finest musicians, cover a variety of Brazilian styles, including Samba, Bossa Nova, Baiao, Afoxe, Partido-alto, and Maracatu. Book includes the usual transposed parts for all instruments plus bonus drum information, showing the basic beats of each style. This CD includes special bonus tracks of the songs being performed so that you can hear the way they should be approached; melodies and solos included.